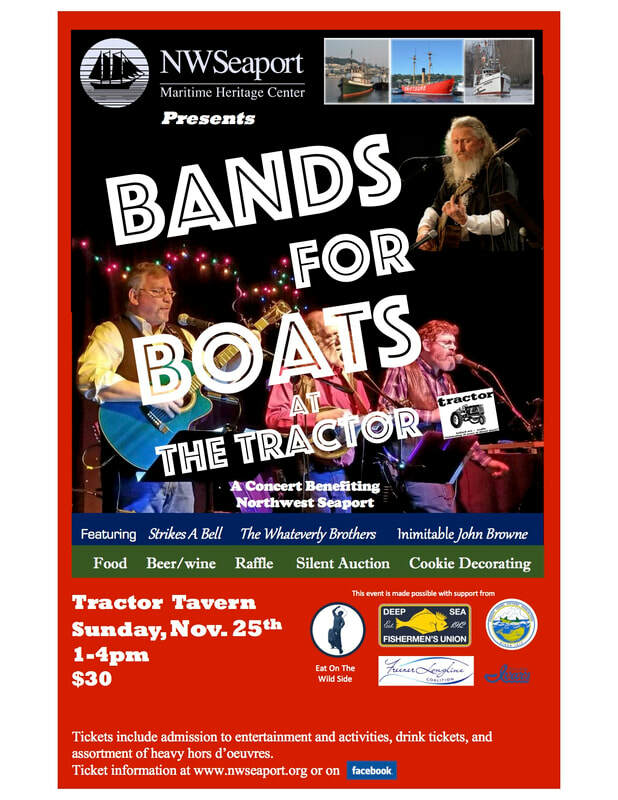 Bands For Boats at the Tractor, held in November, features live music, hors d'oevres, games, raffle prizes, a silent auction, and more. Tickets are $30 and include admission, a free NWS tote bag, and two free tickets for our featured beer and wine. Proceeds from the event benefit Northwest Seaport, a registered 501(c)3 non-profit. Since 1964, Northwest Seaport has striven to preserve and interpret our region’s largest surviving historic ships to serve as education platforms for our community to teach regional history, the physical sciences, marine trades, creativity, innovation, and community service. The 2018 Bands For Boats event was co-presented by Northwest Seaport, The Freezer Longline Coalition, Eat On The Wild Side, Deep Sea Fishermen’s Union, and Fishing Vessel Owner’s Association.